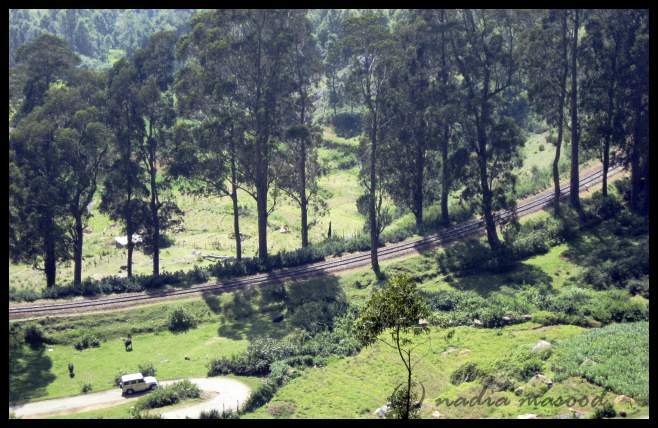 Known as the Switzerland of Nilgiris, Ketti is a very scenic valley en route to Ooty along the Ooty-Coonoor highway. 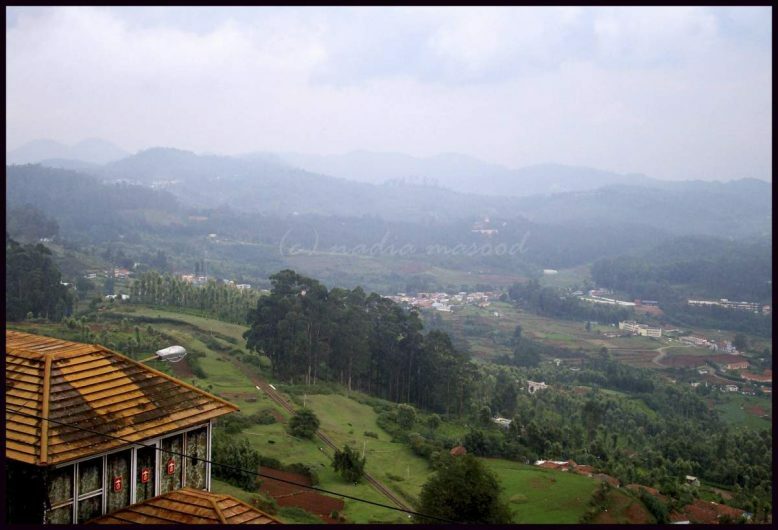 If only we had another day, I would have loved to go down there and explore the town, specially because I heard that one can sight wild boars and elephants there! Another interesting tidbit is that drinking is a favorite habit of many men in Ketti. People drink when it rains “because it is raining” and they drink when it doesn’t “because life’s boring”. I took these pictures through the bus window, while the driver supplied us with information about the valley, like there is a huge sewing needle factory down there and an engineering college. Everyone stayed put in the bus, so I took more pictures, thinking that we were having a brief stopover. Ten minutes and twenty photographs later, the driver suggested we get down to enjoy the view. However, right there at the steps of the bus stood a boy – not more than 14 years old – holding out tickets. “What’s that for?” I asked. “Twenty rupees for the camera, ma’am,” he replied. I looked at Masood, who looked at me with that if-you-want-to-take-more-pictures-then-I’ll-get-you-a-ticket look. Of course I didn’t want to take more pictures, I had taken enough from the bus itself. Nevertheless, I find it ridiculous how they charge tourists to take pictures of the landscape. My mood quickly lightened up, however, when the driver stretched out a hand and pointed down at the railroad track. “That’s where they shot that song, Chaiyya Chaiyya,” he said. If you look closely at the first picture, you’ll notice the tracks, between the trees and the house, and more clearly in the picture below. If you watch Hindi films, I will not believe you if you say that you have never heard or saw the Chaiyya Chaiyya song. But the most interesting part was how our driver got us to that place where we stood admiring the entire valley. There was a sharp detour from the main road, and it was – and I am not kidding you – so vertical that I can not imagine how a vehicle could go down there except by rolling. At first we thought, “Okay, so he’s just going to park here. We’ll get down and take pictures.” But no, he drove straight down! We held on to whatever solid and sturdy object that our hands could grab at that moment, and began praying for our life. Once we reached a safe, horizontal surface, it took me a few minutes to return back to my normal, picture-taking self. Here’s an illustration of what we went through, though I seriously believe that I didn’t do justice by not making the road vertical enough. Awww, thank you so much! You are the sweetest, and hence, as a token of my appreciation, I shall make you a cup of lemon mint tea when you get home tonight. Behbood, you are giving him ideas aur woh bhi mere blog pe?! 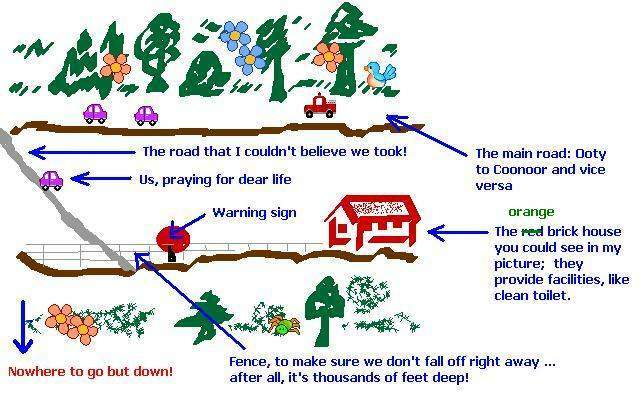 Nice explanation and also extremely intelligent pictorial description..
That’s very sweet of you, Narendra! Actually, I’ve always wanted to write a book (have secretly dreamt about it several times), and it will be – most probably – about travel and photography combined. I can’t separate those two anymore. But I would need to travel more to be able to write a book that people would actually want to read. Until then, I’ll improve both my writing and photographic skills on this blog. And, most importantly, learn from the comments that I receive here. Ooh that’s cool that you saw the place the song was filmed! Awww, thank you for the golden star, Specs! It’s my blog’s first star, and I’m so proud of it! And yes, ive never heard of the Chaiyya Chaiyya song. Wheres that from? Did you just say you’ve never heard that song? The Chaiyya Chaiyya song? *super shocked* You Google it, jaldi se 🙂 It’s from SRK’s film called Dil Se, by the way. Thanks for the nice comments at my blog…I can’t wait to read more of your posts. I’m still in Europe…so I don’t have time right now! Hi Sherry! Enjoy Europe and return home with amazing pictures and memories! … but didn’t anyone say anything to the driver for what he did ? Welcome to the blog, Sharmila! If anyone said anything to the driver, I didn’t notice. I was busy panicking, praying and then, moments later, back to taking pictures. That’s perfectly alright; I don’t watch movies either. Well, maybe just 2-3 per year, that’s all. I don’t have the patience to sit through an entire movie anymore. Old age. Walaikum Assalam Atie, thank you! Yes, you are absolutely right: it is from the Dil Se movie.